Box Text: Wear The Cap. Be The Max. Save The Planet. You've seen every episode. You know all his moves. The question is...are you ready to wear the magic cap??? 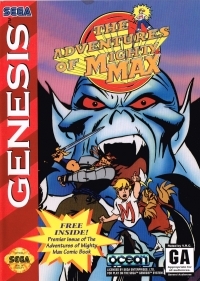 Dust off your traveling shoes- it's time to play Mighty Max! SkullMaster has scattered pieces of the mighty doom weapon all over the planet. Go solo or double the action in 2-Player Split Screen mode, and embark on an earth-saving scavenger hunt through time. Time travel to 50 different worlds. Crush SkullMaster's evil minions. Save the planet. Have more fun than watching the cartoon! - Team up with Felix and Bea and warp to cool places like the jungle and outer space. - Time travel with - or race against - a buddy in incredible 2-Player Split Screen Play. - Be the Max and unleash your tennis ball cannon on restless natives and goofy aliens. 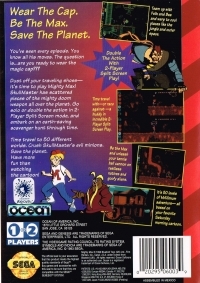 - It's 50 levels of MAXimum adventure- all based on your favorite Saturday morning cartoon. 08-02-2015 Seikenfreak Box Text Wear The Cap. Be The Max. Save The Planet. You've seen every episode. You know all his moves. The question is...are you ready to wear the magic cap??? Dust off your traveling shoes- it's time to play Mighty Max! SkullMaster has scattered pieces of the mighty doom weapon all over the planet. Go solo or double the action in 2-Player Split Screen mode, and embark on an earth-saving scavenger hunt through time. Time travel to 50 different worlds. Crush SkullMaster's evil minions. Save the planet. Have more fun than watching the cartoon! - Team up with Felix and Bea and warp to cool places like the jungle and outer space. - Time travel with - or race against - a buddy in incredible 2-Player Split Screen Play. - Be the Max and unleash your tennis ball cannon on restless natives and goofy aliens. - It's 50 levels of MAXimum adventure- all based on your favorite Saturday morning cartoon. This is a list of VGCollect users who have Adventures of Mighty Max, The (VRC) in their Collection. This is a list of VGCollect users who have Adventures of Mighty Max, The (VRC) in their Sell List. This is a list of VGCollect users who have Adventures of Mighty Max, The (VRC) in their Wish List.